Scooters are gaining market share from their all time rival - bikes. According to the reports, the year 2013 was of the scooters. Last year, Honda Activa has overtaken Hero Splendor as the largest selling two wheeler in India. In last few years, a lot of women started riding automatic scooters, even in the rural areas of the country, making it one of the fastest growing segments in automobile industry. Last year, a few new scooters were launched. Let us go through the new launches in 2013. TVS launched its first scooter for the male segment in October 2013. TVS Jupiter, smartly priced below Honda Activa and Aviator, is slowly gaining momentum in the Indian automobile market. 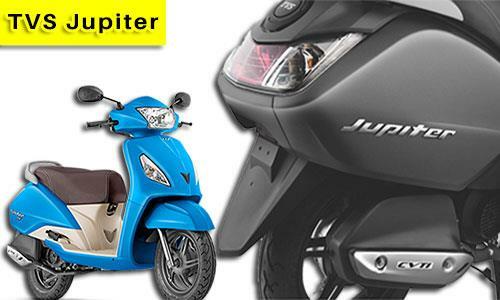 To please the male segment, Jupiter comes with the largest leg space in the scooter segment, even though it is at the cost of missing front storage compartment. Also, Jupiter introduces pass lights, which are usually found only in bikes. One of the unique selling points of Jupiter is its external fuel valve, which allows you to fill fuel without getting up from your seat. Analysts predict Jupiter could be a game changer for TVS in the fast growing scooter market. Piaggio recently re-entered the Indian scooter market last year with its Vespa LX. Now, they have expanded its portfolio with the premium scooter Vespa VX, targeting the premium segment. Priced Rs 71,380, it is the most expensive scooter in the country. Piaggio is looking at creating a premium scooter segment, which is non-existing currently and the sales chart of Vespa LX proves they are on the right path. Vespa VX is powered by a 125 cc engine, developed by Piaggio for the Indian market. It has been speculated for a while that Honda will introduce a new 125cc scooter in India since they don't have one in that segment to compete with the rivals like Suzuki Access 125. However, Honda surprised the analysts by launching a new scooter in the same 110cc category, and called it "Activa i". Activa i is a sleek and stylish scooter, best suited for women. Except for the name, it has no close similarity with the all time popular Activa. Honda continues to market Activa as a family scooter while the Activa-i is more appealing to the women.